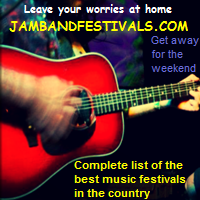 JAM BAND FESTIVAL GUIDE IS FOR THE MUSIC FESTIVAL FAN THAT LOVES MUSIC AND WANTS AN EASY PLACE TO FIND ALL THE MUSIC FESTIVAL AND TOUR BAND INFO IN ONE PLACE. WE ARE COMMITTED TO PROVIDING JAMBAND, NEWGRASS, AND FOLK MUSIC FESTIVAL LISTS AND TOUR BAND INFO. Here is an amazing version of "Can't Find My Way Home" Performed by Eric Clapton, Steve Winwood, Derek Trucks and friends. Enjoy! If you like our festival guide or appreciate our site advertising your festival for free, please copy and paste our link banner to your site. We are determined to make all outdoor Jam Band music festivals successful. A little fun from a live Twiddle show. Followed by over a hundred great Jamband artists from today and yesterday. "the pioneering Godfathers of the jam band world". They were ranked 57th in the issue The Greatest Artists of all Time by Rolling Stone magazine. They were inducted into the Rock and Roll Hall of Fame in 1994 and their Barton Hall Concert at Cornell University (May 8, 1977) was added to the Library of Congress's National Recording Registry.The Grateful Dead has sold more than 35 million albums worldwide. Jam bands are musical groups whose live albums and concerts relate to a unique fan culture that began in the 1960s with The Grateful Dead, and continued in the 2000's with bands like Phish. The performances of these bands often feature extended musical improvisations ("Jams") over rhythmic grooves and chord patterns, and long sets of music that cross genre boundaries. If you appreciate our contribution to live music, please donate any amount you feel comfortable with. Our staff would be very grateful.